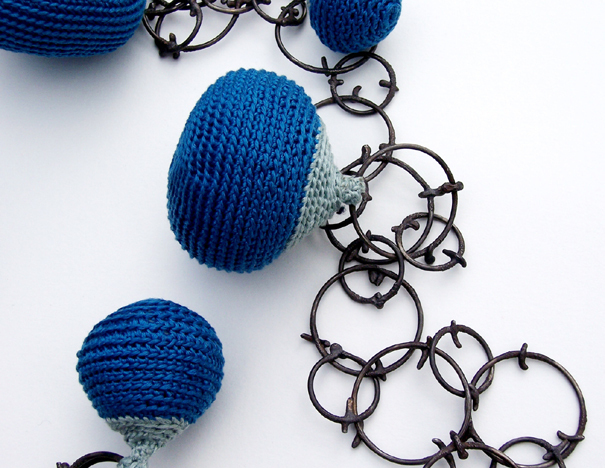 J’ai tout d’abord découvert les bijoux de Joanne HAYWOOD à la Galerie CARACTERE, à Neuchatel (CH) : premier coup de coeur …. en attente de faire des économies ! J’en profite pour vous présenter cette expostion : « Thread Bare », à la Rochester Art Gallery. « Thread Bare » presents four contemporary artist-makers who use textiles to explore the human condition and gender-related concerns, relationships between past and present, and narratives constructed around personal and cultural identity. Contradictions and ambiguities abound in each artist’s work. Craig Fisher’s soft, sculptural installations question representations of violence and macho stereotypes whilst Lucy Brown explores the complex issue of female identity, reworking vintage garments into abstracted, figurative forms. Joanne Haywood takes part with her recent work. 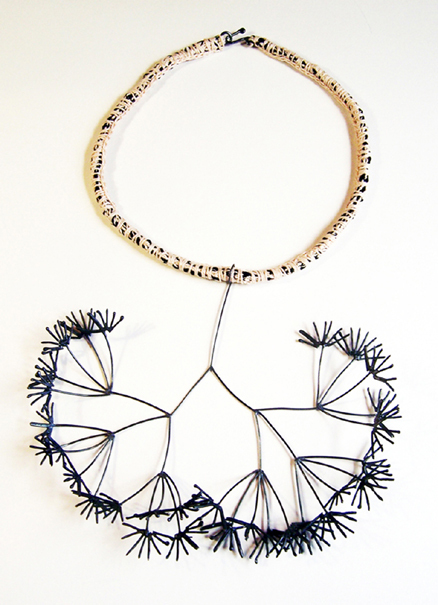 Mixed-media jewellery draws on the conflicts of opposites : skeletal wire forms and fleshy crocheted volumes; the natural and unnatural; the absence or presence of colour; the interplay of light and shadow. Joanne Haywood’s work takes up the human story through pieces that reach back into the faraway history of the Thames Valley and the exposed objects that come to light through mudlarking. Taking the clay pipes that speak in their materiality of the bones and shell that also archaeologically evidence London’s history, Haywood is interested in the transitional, as seen through metal oxidisation or the juxtaposing of skeletal metal and the fleshliness of textiles. 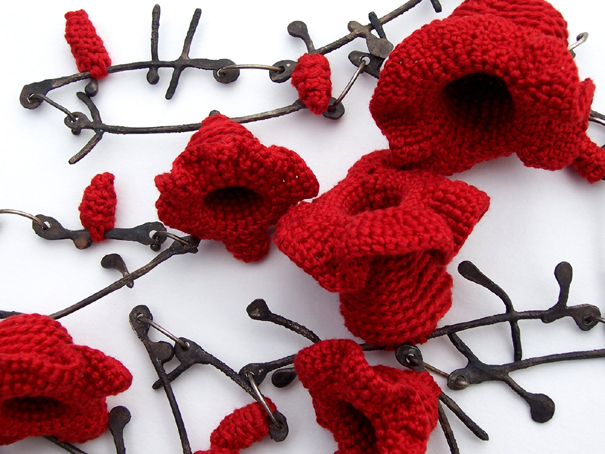 In her Pipe Flower Neckpieces, she builds onto the historical artefact something of the living textile, reminiscent of the loss of textile artefacts to water damage and time but also indicative of the re-inventive power of threads. Like Minta’s missing brooch in Virginia Woolf’s To The Lighthouse, (in) significant objects, especially those of desire sustain and prevail, and offer themselves unexpectedly from the past for our engagement and re-visitation. 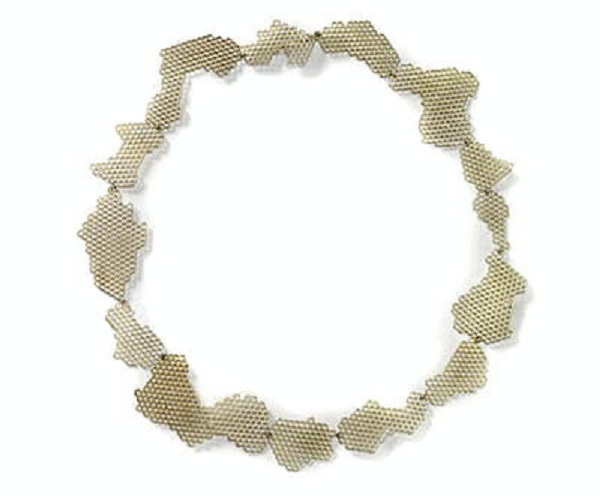 The Institut für Schmuckkultur (Institute for Jewelry Culture) was founded by Reinhold Ludwig in 2007 with the purpose of documenting the work of distinguished manufactories, designers and artists and communicating this to the public in a competent fashion. By means of innovative concepts and publications, the Institute helps to maintain, cultivate and further develop a discerning jewelry culture and the applied arts, a goal which is also supported by this internet platform with its Art Aurea magazine and Modern Jewelry Collection. 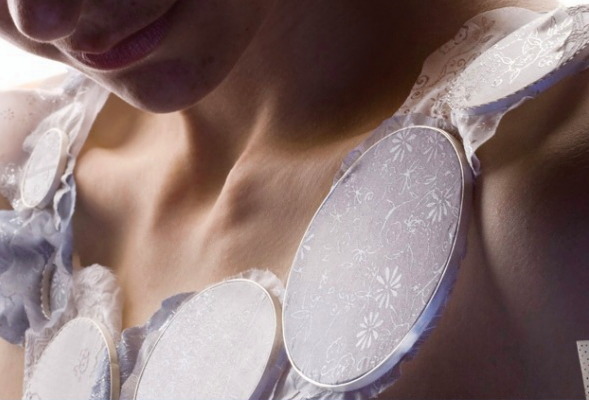 *Kathryn Partington produces one-off wearable items of jewellery by utilising her background training within the discipline of tableware ceramics & printed textiles. She does not leave us with the association of the hoar frost on our skin. She rather conserve it in silver, silk and porcelain with fine patterns. These are applied in various printing and embossing techniques. some of them seems total magic ; it glimmers ever so softly, shimmers delicately and comes across changing just like a changing picture does. 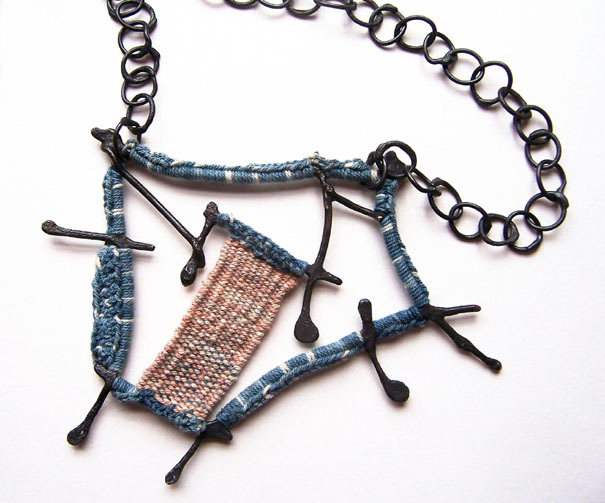 *Anke Hennig combines with her jewellery the colours of winter and icy glitter with her delicate transparency of textile weave, called Monofil. The secret of her invention she keeps all to herself. 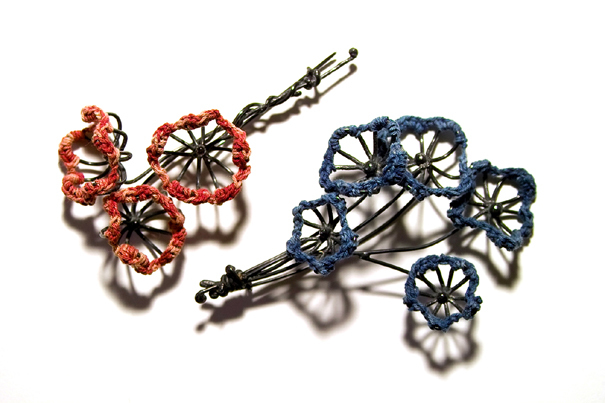 The rosettes which are made into brooches and earrings are light and precious : a flexible development of the chains, partly because of the secrecy of their technique and at the same time their beauty. 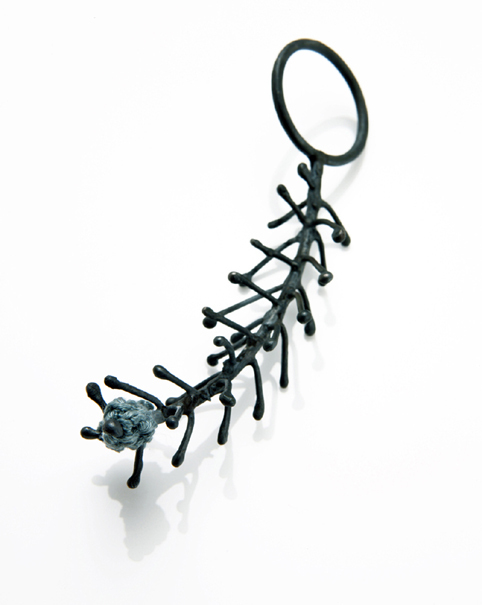 *Michaela Kirchner experiments with tiniest structures, which line up around the neck of the person carrying them as if they were silver-coloured floating ice. Their amorpheus shapes are, melted into tiny glitter sructures which catch the light from all sides and throw back the light, shimmering and prescious. 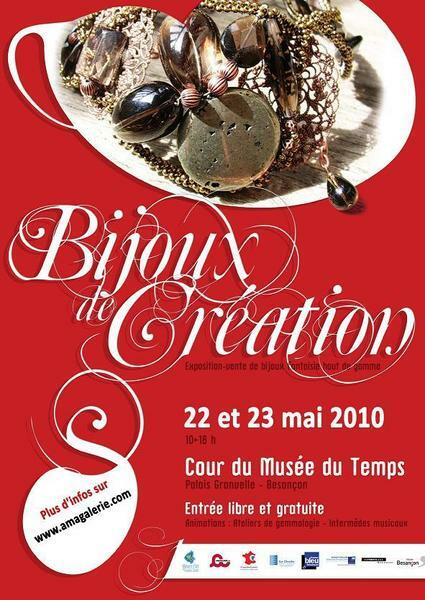 25 créateurs bijoutiers haut de gamme, tous professionnels, exposeront dans la cour du Musée du Temps de Besançon, les 22 et 23 mai 2010. Ateliers d’Art de France encourage les artisans d’art en début de carrière par la remise de Prix La Relève, sur des salons métiers d’art dont elle est partenaire, en province. En coopération avec les organisateurs de salons, elle sélectionne le lauréat, exposant pour la première fois à ce salon, sur des critères de savoir-faire et de créativité. Les artisans d’art ainsi choisis se voient remettre cette répompense, d’un montant de mille euros. Le prix La Relève sera remis lors de « Bijoux de Création ».